For a patron with the knowledge of clocks and clockmaking that George III certainly possessed the appeal of a clock of this type lay in the equation of time movement constructed by one of the leading French horological theorists of the day, Ferdinand Berthoud. It may also be fair to say that the handsomely mounted case, one of the most felicitous creations of the cabinet-maker and sculptor Charles Cressent, would have also aroused the King’s admiration and that it appears in the background of Zoffany’s celebrated portrait of Queen Charlotte with her two elder sons strongly suggests that its acquisition was as much or perhaps more in deference to the Queen’s taste for continental furniture as to the King’s for horological invention. It seems likely to have been made for the Trésorier-général of the French navy, Marcellin-François-Zacharie de Selle, who furnished his study in Paris in the rue Sainte Anne with pieces by Cressent. The date of acquisition by George III is not known but de Selle's collection was sold in Paris in 1761 so the clock had probably only recently arrived in England at the time Zoffany painted it (c. 1765) in a room on the ground floor at Buckingham House. At a later date it was placed in the Queen’s Sitting Room at Kew. The case must, therefore, be a relatively late repetition of a model that Cressent first devised in the 1730s, but remained popular late into the reign of Louis XV. The well-integrated and finely finished mounts show Cressent’s skill as a sculptor to great advantage. It has a serpentine outline and is bowed in the centre of the front. A figure of Time reclines on the hood and a pair of winged zephyr heads in clouds is mounted on the front below the dial. To the sides are lion's masks crowned by fretwork plumes. Panels are veneered in satinwood and purplewood. The case is supported on splayed foliate lion's paw feet and a serpentine plinth, rounded at the corners. Berthoud, who was awarded the rare distinction for a foreigner of election to a Fellowship of the Royal Society of London in 1764, became a maître-horloger in 1753. The sunken central gilt bronze disc of the dial is chased with a trellis pattern with a cartouch at the top with the maker's name 'Ferdinand Berthoud AParis'. The silvered outer band has an inner chapter ring with the hours in Roman figures and the outer ring with multiples of five for the minutes in arabic numerals. An aperture at the base displays the months and the signs of the Zodiac. A smaller aperture to the left shows the leap year and the following three years. The original movement was replaced by Benjamin Lewis Vulliamy in 1821: Vulliamy number 783. 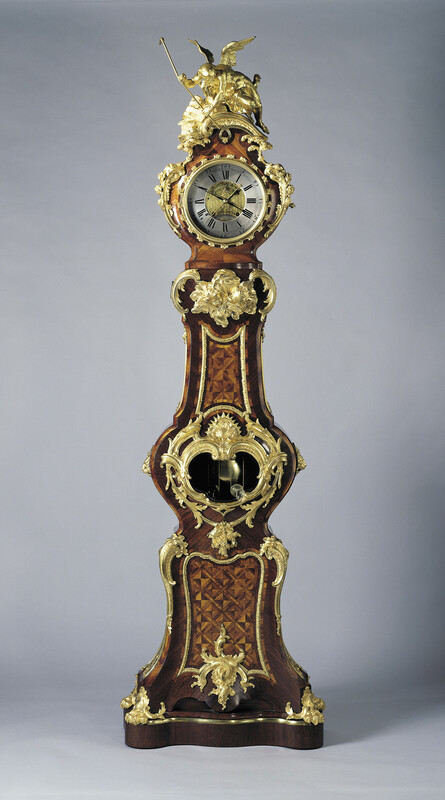 Described in the Clock Book as an 'Eight day long clock with the equation from the Berthoud long Clock from Kew. The King' Bill for £1 10s. 10d'. It is now an eight-day. weight driven. rack striking and equation mechanism with a dead beat escapement. The calendar wheel is driven from a double ratchet wheel fitted to the great wheel on the time slide. The oak pendulum is fitted with a lenticular bob terminating in a graduated rating nut marked by a steel pointer. Likely to have belonged and to have been made for the Trésorier-général of the French navy, Marcellin-François-Zacharie de Selle whose collection was sold in Paris in 1761; acquired George III by 1765. Oak case with purplewood and mahogany marquetry, gilt bronze mounts. Gilded and silvered dial with blued steel and gilt hands.